had become the eastern terminus for most transatlantic crossings. Western Docks are built on land that was reclaimed from the sea in the first half of the 20th Century. Today, there are four cruise terminals. 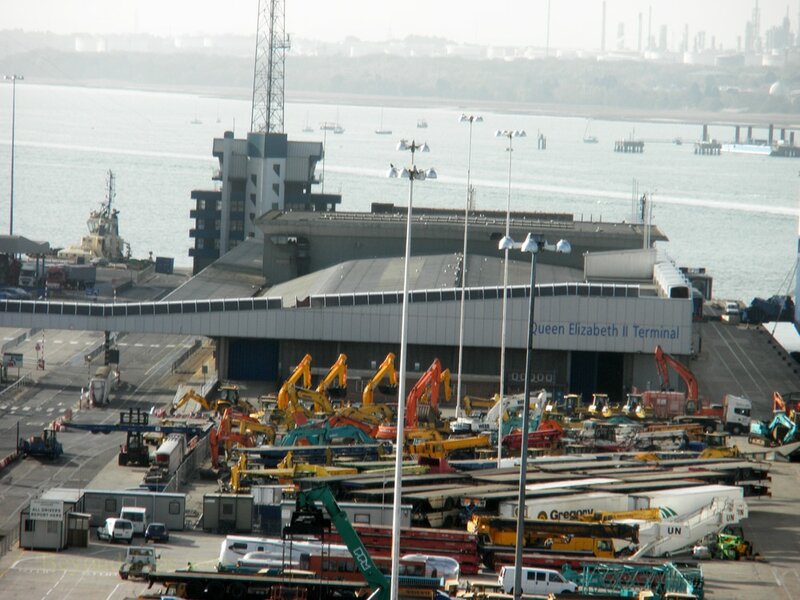 In the Eastern Docks, there is The Queen Elizabeth II Terminal (Berths 38 and 39). 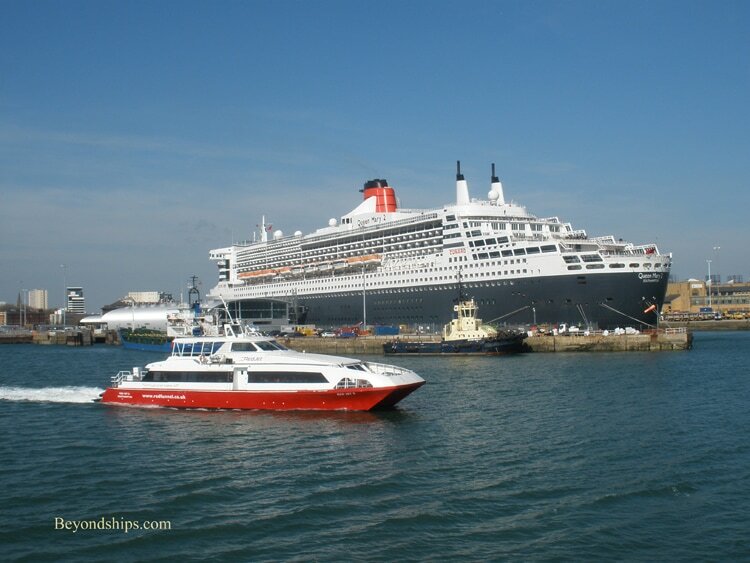 Although it was home to the Queen Elizabeth 2 (QE2) for most of that ship's career and is often referred to as the "QEII terminal", it is named after the monarch, not the ocean liner. Today, it is used by a number of lines. 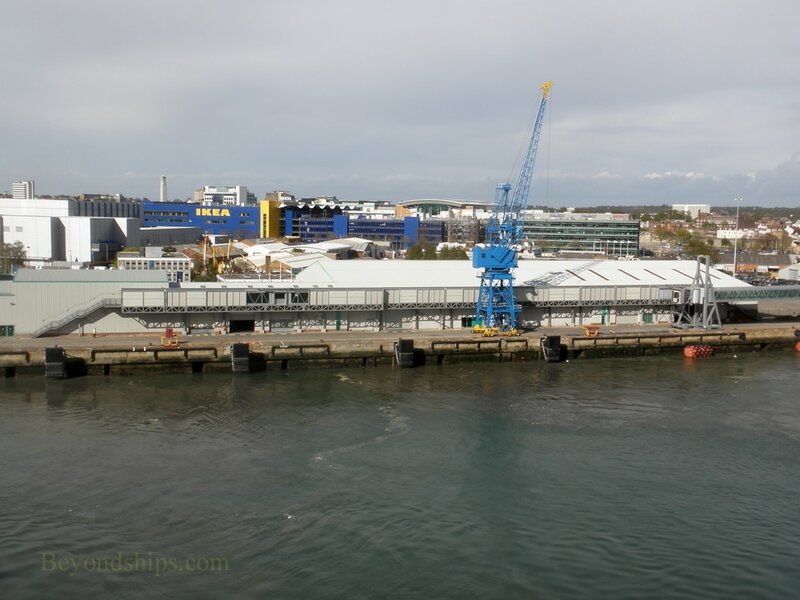 Nearby is the Ocean Terminal (Berth 46). 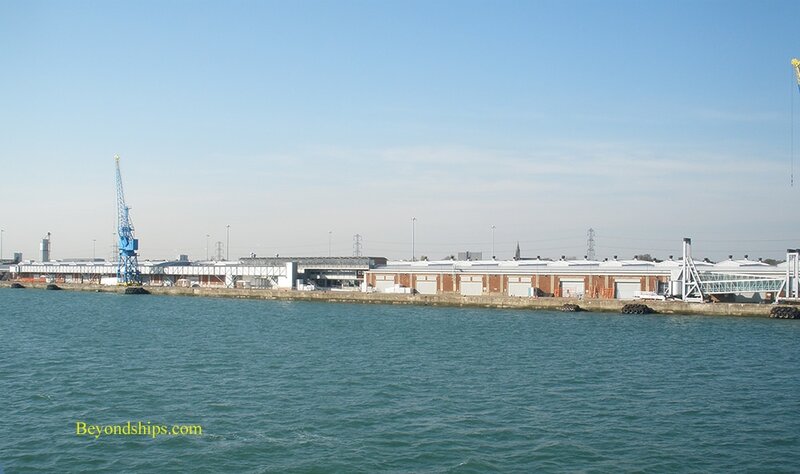 A modern facility, it is built along the old slip where the Titanic docked. 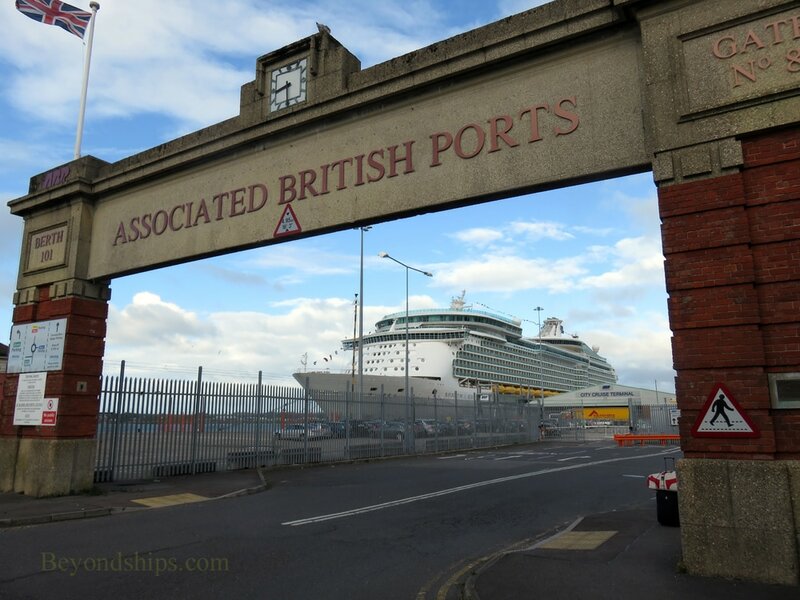 Now, it is often used by Cunard and P&O ships but ships of other lines use the terminal on occasion. at Carnival can see (and hear) the RCI and Celebrity ships while passengers on those ships can see the signs for the various Carnival brands atop the Carnival UK building. is often used by Princess and P&O Cruises. 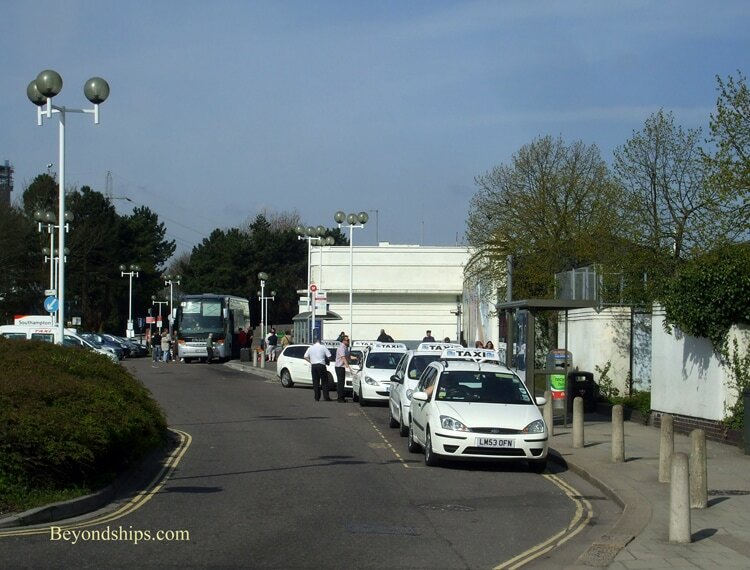 people arrive and leave the terminal via coaches, private cars or one of Southampton’s numerous taxis. Above and below: The Queen Elizabeth II Terminal is at the mouth of the harbor. Above and below: The Ocean Terminal. 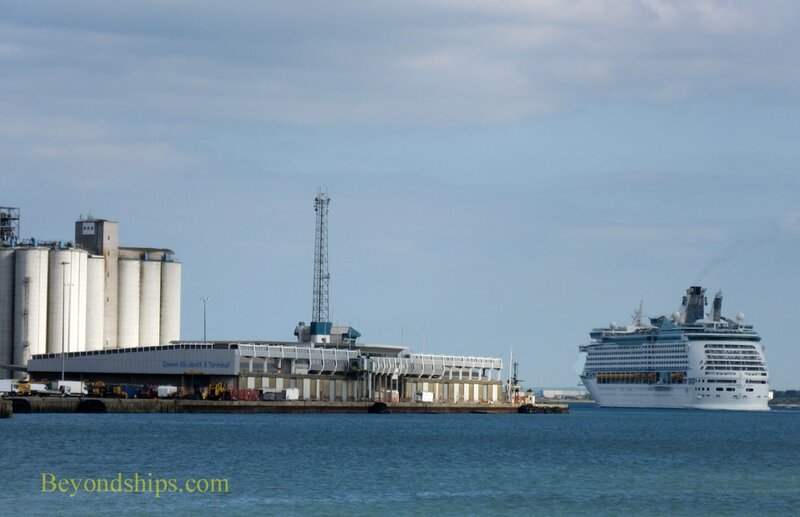 Above left: Navigator of the Seas berthed at the City Terminal. Above right: The City Terminal from the water. 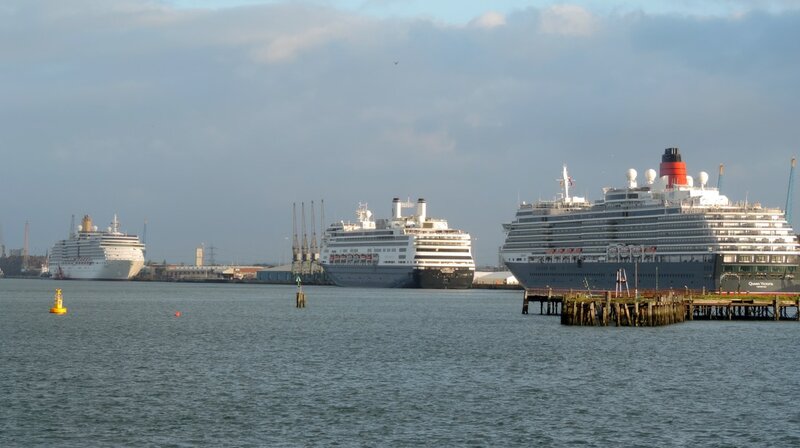 Below left: Queen Victoria at the Mayflower Terminal. 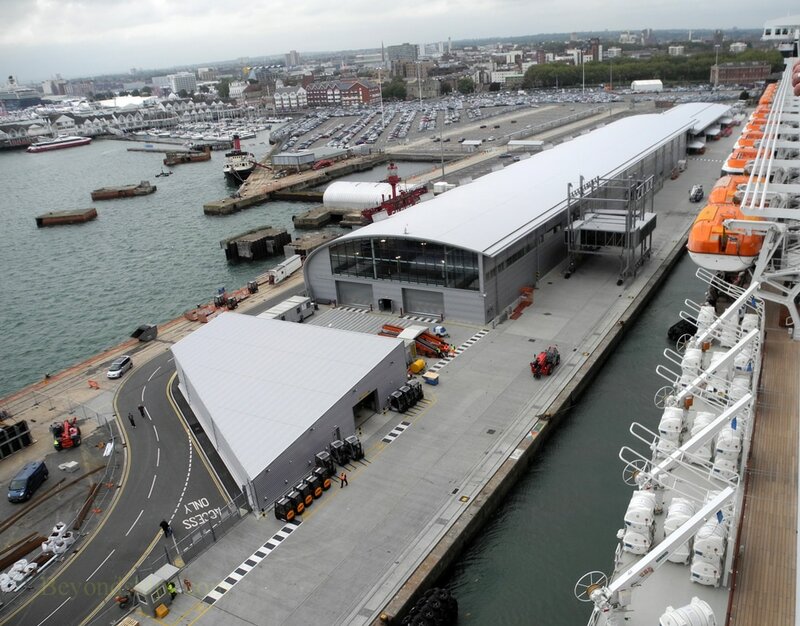 Below right: It is not unusual to see a ship docked between the City Terminal and the Mayflower Terminal. Here, Rotterdam is docked between Aurora (Mayflower Terminal) and Queen Victoria, this time at the City Terminal. Above and below: The Southampton Central railroad station. 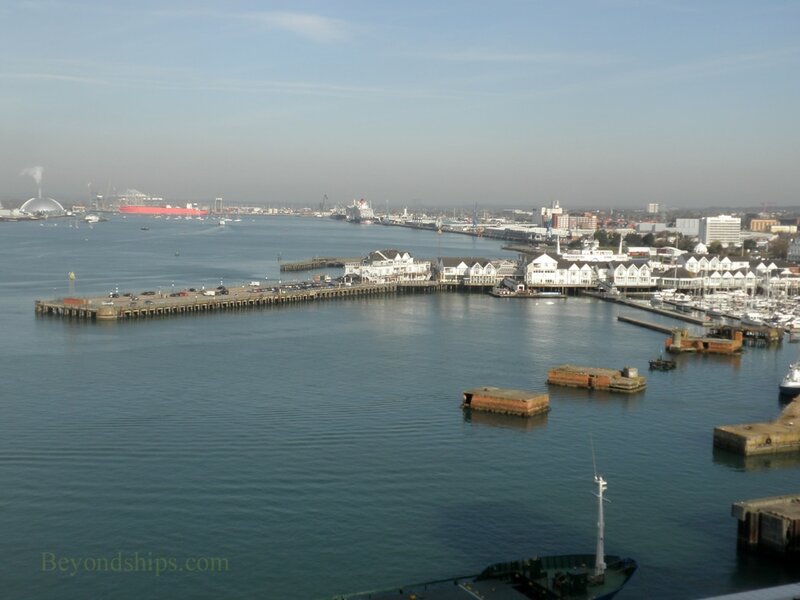 Southampton is located 62 miles (100 km) from London. 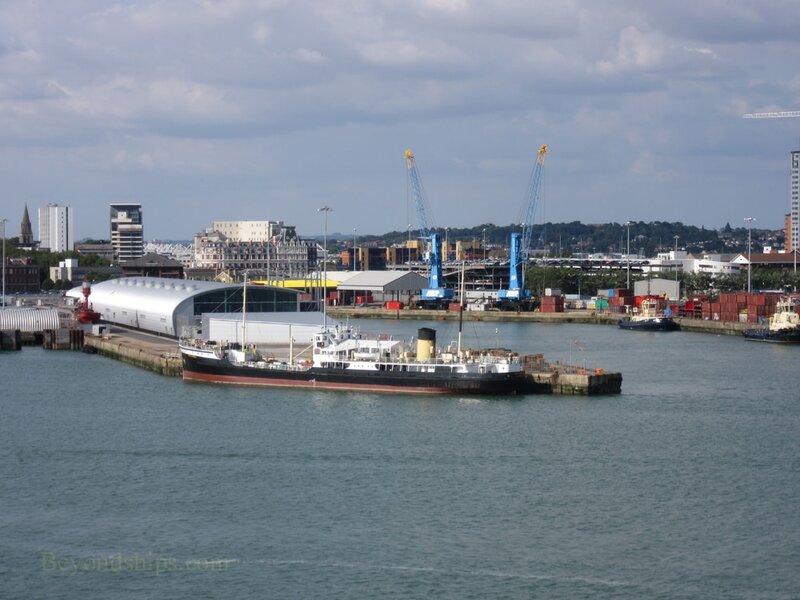 There is frequent train service from London to Southampton Central Station, which is located within the City closest to the City Cruise Terminal. Trains take a minimum of an hour, depending upon the time of day, to traverse the distance. 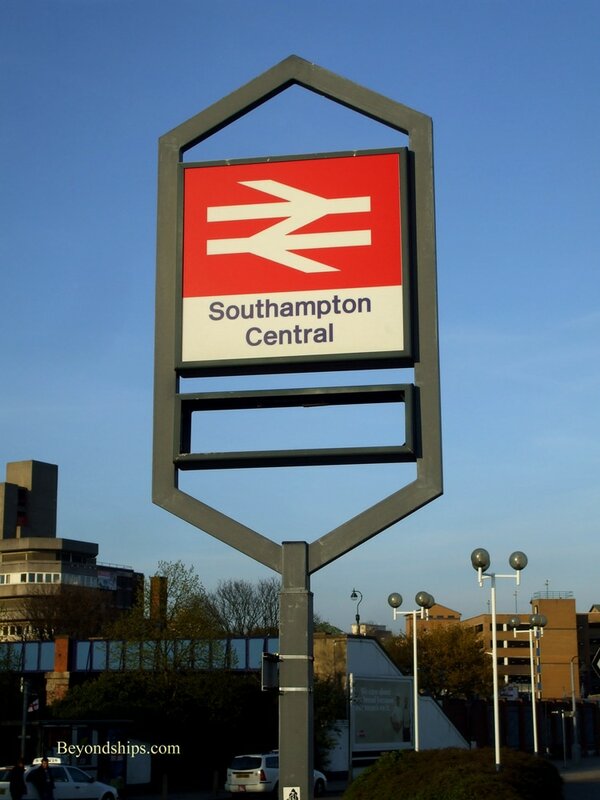 There is also regular train service between Southampton several other British cities including Portsmouth. The trains are designed for commuter service. There are usually areas in the cars for luggage but these can fill up quickly if it is a popular train. Outside of Southampton in the town of Eastleigh is Southampton Airport, which is a regional airport with flights to UK and European destinations. Southampton is about 65 miles from London Heathrow Airport. There is a direct bus service but no direct train service. Gatwick Airport is 95 miles away but there is a direct train service. National Express operates coach service between London and Southampton. ​Some of the cruise lines (e.g., Cunard) charter coaches to take passengers from London to Southampton. The M27 motorway links Southampton to other towns along the south coast. Going to or from London involves taking the M3 Motorway. Once in Southampton, there are a variety of alternatives for getting around. 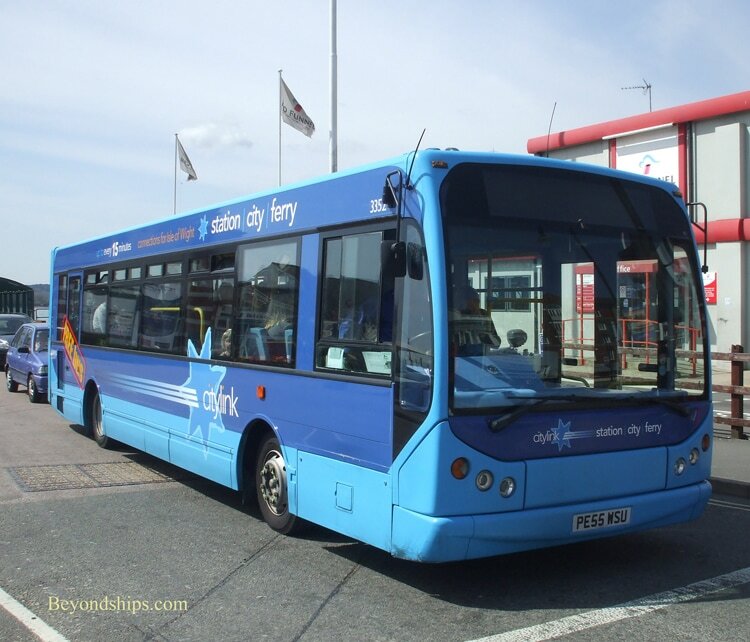 One can drive but in recent years, there has been considerable congestion around Southampton, particularly on days when there are several cruise ships in port, a professional football match is being played or there is a sale at one of the city’s big stores. The congestion near the docks has improved following the completion of a road works project. Southampton is a walkable city. The central area is pedestrian-friendly with good sidewalks and pedestrian-only areas. However, Southampton is a busy city and there is a good deal of traffic. Of course, drivers follow the British system of driving (i.e., the steering wheel is on the right side of the car and they drive on the left side of the road)) rather than the American/European way and so pedestrians from outside the UK should be careful crossing streets. There are numerous taxis operating in Southampton. In addition, there are bus services that runs through the center of town and to the Southampton Central railroad station. At the Town Quay are terminals for the Hythe Ferry, which carries people across Southampton Water to the village of Hythe, and the Red Jet Ferry, which is a high-speed service between Southampton and Cowes on the Isle of Wight. 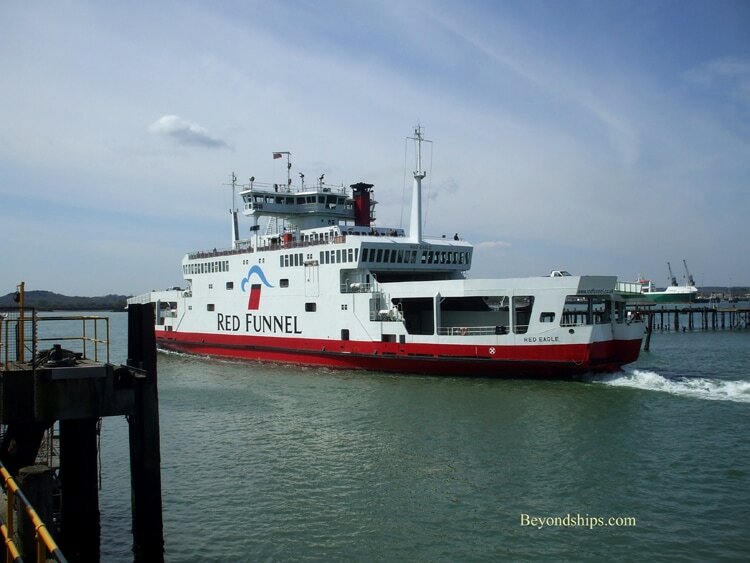 Nearby is the Red Funnel Ferry, which takes people and vehicles to the Isle of Wight. Above: The Red Jet catamarans run a fast service to the Isle of Wight. Below: The Red Funnel ferries also go to the Isle of Wight. They are not as fast but you can take your car.